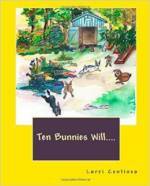 My very own watrcolor illustrations of a long day in the lives of some very special bunnies. A playful verse book with two calming bedtime poems to end the day. Quantity buy - 5 books. Please see book listing above. A versatile piece of jewelry! Wired ribbon tie had enough length to be worn as a neckalce, or double as a choker, or get creative with a wrap as an arm band. A genuine amethyst and glass beads hang from a short length of copper tubing...we don't throw much away...and it is tied to a lovely gift card...all set to go! 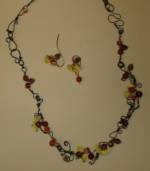 Chunky ukalite leaves and red jasper earrings on copper wires. beads. Green adventurine leaves. Necklace and earrings sold as a set. This set is SOLD. Can make similar to order. SOLD-will make one similar for you upon request. Hand twisted copper stars tip the ends of this suede thong bookmark. One end holds seven semi precious gemstone beads, each representing each of seven chakras. Shipped with card and envelope for instant gift giving or will ship for you. 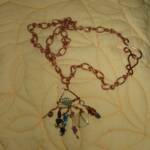 Bits of fun color and semi precious stones are captured with copper wire work. The triangle hold a green adventurine leaf, and bits of amethyst, kyolite, are among the semi-precious removable gemstones that dangle from the bottom of the pendant. Hand crafted copper S-hook closure; copper chain. Recycled copper hand twisted and coiled about a polished smooth tri-color stone. 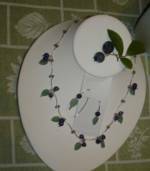 Choose from choker round, chain, or silk ribbon. Most of our creations are one of a kind, some can be replicated or made to your preferences. Please ask. Sea and Copper and Chalcedony!!! 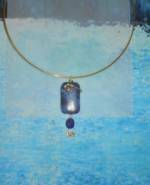 Hand tooled copper pendant hangs side by side with Blue Chalcedony drops. The clasp is also hand made to sit to the side for easy of fastening and to help avoide those nap of neck hair tangles. Handcrafted bits also very simply like a bit of up front showing off. 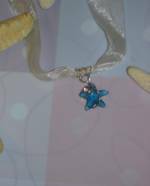 A genuine Swarovski crystal star wears hand crafted sterling silver coils and bail. 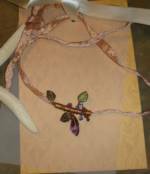 Lovely pendant hangs from a double strand silk ribbon. 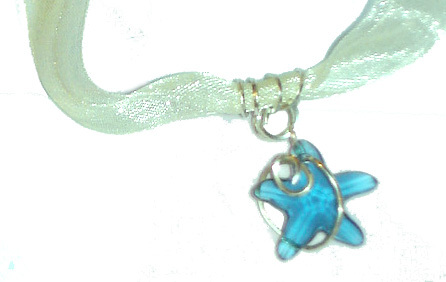 This one is Aquamarine, but other colors are available. A little porcelain Prince Charming frog for your belt, purse strap, or cell phone. A little Sterling Silver wire work and bit of genuine Malachite make this extra special! Light yellow jade discs and geniune aquamarine beads live on a very different kind of gold fill earwire. 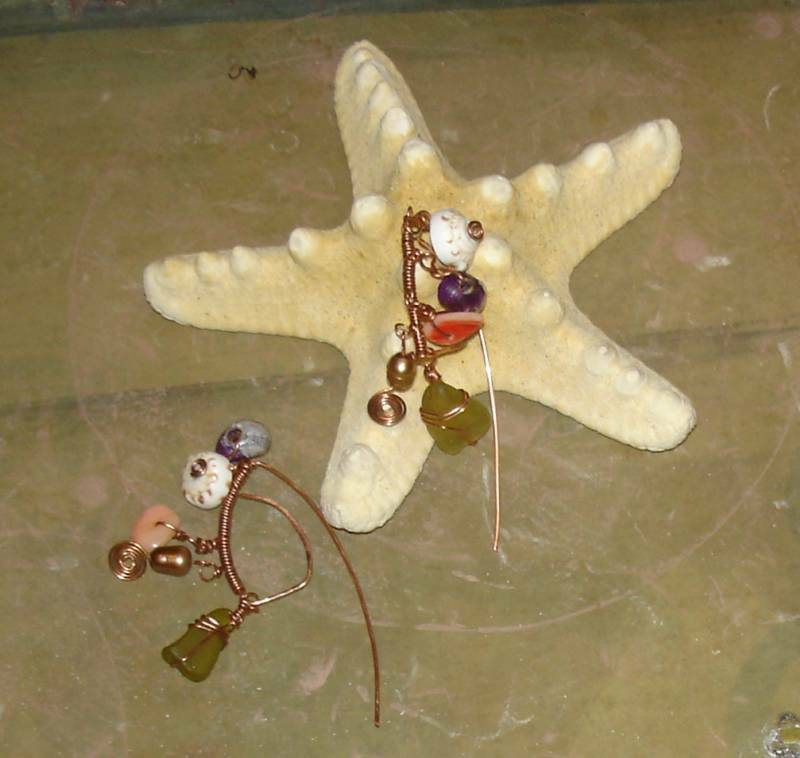 Sterling silver wires, jasper and sterling stars. Each pair is slightly different because of natural products, used. If a particular shade (or shape) is important to you, please contact us directly. Also available in copper or brass. 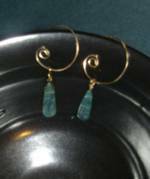 Deep teal colored 'green' kyolite dangle on 14K Gold Fill spirals. 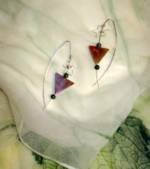 Other dangles from the chakra collection can be purchased here and added. Tourmalated quartz 'leaf' holds a pink freshwater pearl in this delicate pendant. Green ribbon neckalce with hand crafted S-hook closure in sterling silver. I'm fond of blending the past with present for new presence! The silver loops and their pinks and greens are removable. Secure the ends with a bit of ribbon and nostalgia blossoms again. 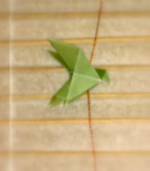 Vellum origami doves. 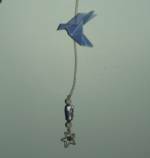 Each hand folded dove has a tiny hanger for attachment to wire or string to hang from windows or mobiles, or whatever you like. Affordable party favors! Package of 10 in assorted colors. Vellum origami dove sits on a recycled copper hand-twisted wire. Coordinating semi precious gemstones and a wirework star dangle beneath. Buy a few! Makes a ready gift for any occasion. Email us if color and stone are important. Discounts given for bulk orders for wedding party gifts or fundraisers. See also silver wired and multi-dove strands. 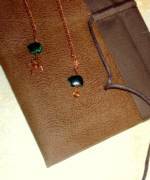 Two little malachite zumi bears hang from this copper chain bookmark. Hand twisted copper stars tip the ends. Malachite Zumi bears with sterling silver wirework stars and earwires. Copper coils and sterling stars set off polished labradorite drilled stones. 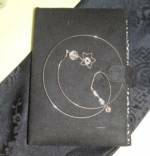 The stars and earwires are both hand crafted. I will make these for you with other favorite semi-precious gemstones. Just ask. A new shape for a new idea, charm earrings!!! Each pair is different, but all from nature such as shells, bits of drift wood, small stones, sea glass, coral, freshwater pearls....bugs? Just kidding. These were a special order, but can make something similar for you. Two lapis lazuli stones on a simple gold wire hoop. 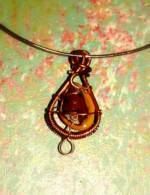 The wire wrap work on the pendant is 14K gold fill. These are available with similar stones and in copper, brass, or silver with Lapis Lazuli (shown, dark blue with gold flecks), Amazonite, (medium blue-green) , Fire Agate (red/pink/brown), With Green Sedimentary Stones/Jasper, and Turquoise. If you have another favorite stone we can usually accommodate. A tiny wizard charm and sterling silver wound turquoise seaglass dangle from each end of silver plated chain; decorated in cranberry dyed freshwater pearls. Long enough to mark two pages of a paperback or grace a large coffee table book. Made in Maine by Fyresprite. SOLD - Fyresprite is out of wizards, but can make a similar item with dragon charm.